For some reason summertime (and spring) is often known as ‘wedding season’ (even though I personally would always prefer getting married in the fall, especially in Indiana) and with that comes a deluge of wedding products and lines from all over the place, especially Etsy. I thought I’d join in this year (albeit a teensy bit late) and show off some of my wedding specific wares. First, there’s the obvious: the ring bearer pillow hollow book. 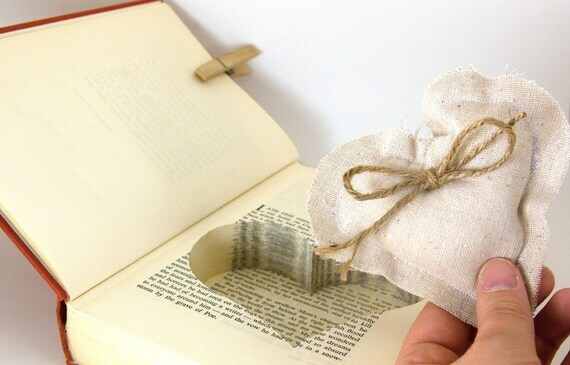 This book can either be filled with a little heart pillow, or just the ring itself. Oftentimes I carve the hole from cover to cover, but I also do my traditional carving from a few pages within to hide what’s inside. Both seem to be a hit. 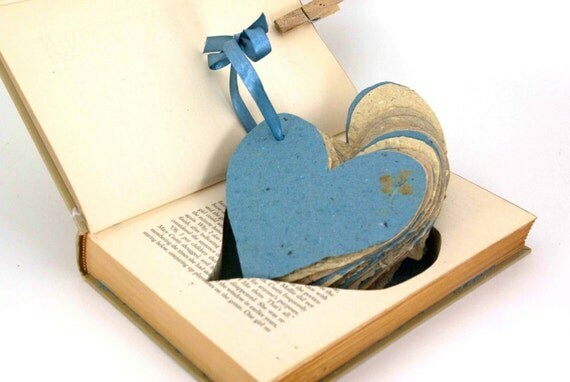 In additional to the pillow add-on, I’ve also created a heart-shaped bound book that fits neatly inside the heart cut-out. This book can be used as a guest book for the wedding, shower, reception, etc. 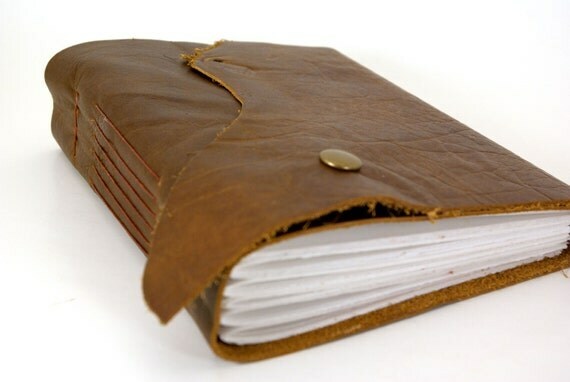 These ‘extra large’ journals are the perfect size and heft for a wedding guest book and keepsake. The pages can hold not only signatures and letters from wedding guests, but they can also hold photographs and other ephemera from the day. Most recently, as in today, I was thinking about a new product. I’ve always mentioned in my hollow heart books’ description that after the big day the books could be used a keepsake photo frame, but I never really illustrated that point very well. I’ve been brainstorming a product all its own in this respect – a book photo frame. They would work along the same lines as my book clocks (hanging from the wall or sitting on a shelf) and be held shut in a similar fashion . . . but I’m rethinking the interior design (the gluing process) to make the book still usable. I’m excited, and I hope you are too! Would you use/display a vintage book photo frame? Would you gift one? What special photo might you place inside? I love this idea…would love to hear more about it too!